Ever since I took my first French class in sixth grade and saw a poster of Le Mont Saint Michel hanging on the classroom wall, I have wanted to visit this tiny island with a population of less than 50, that lies just off the coast of Normandy in France. When we decided to go to Paris for New Year's, I knew I had to take advantage and make this side trip, even if just for one night. This is the million dollar question. The easiest (albeit not the cheapest) way to get to Mont Saint Michel is by car. If you are not up for driving, from Paris you will take the TGV train from Montparnasse station to Rennes or Pontorson. From either station, you will then take a bus to the Mont Saint Michel car park. From Rennes it is about an hour bus ride, from Pontorson, about 20 minutes. I frequently referred to this guide when planning our trip. Whether driving or arriving via the bus, you will find yourself at the carpark. From there, you have access to a free shuttle that comes every 5-10 minutes or its about a 10 minute walk to the main strip of hotels or a 35 minute walk to the Mont. Because we were arriving in France in the early morning from a red eye flight, we did a combination of both methods, having a car drive us from Charles de Gaulle to our hotel in Mont Saint Michel and then taking the bus/train option back to Paris the next day. This car company was great! Whether coming via chauffeur or rental car, if you are staying across the causeway from Le Mont, beware, you will need a password to access the town. We stayed at Le Relais Saint Michel, for the sole reason of soaking in the views. The staff was very friendly and we were upgraded upon arrival. I wouldn't classify it as the lap of luxury, but it was convenient, clean and I could lay in bed and enjoy a spectacular view of Le Mont (every room has a view!). 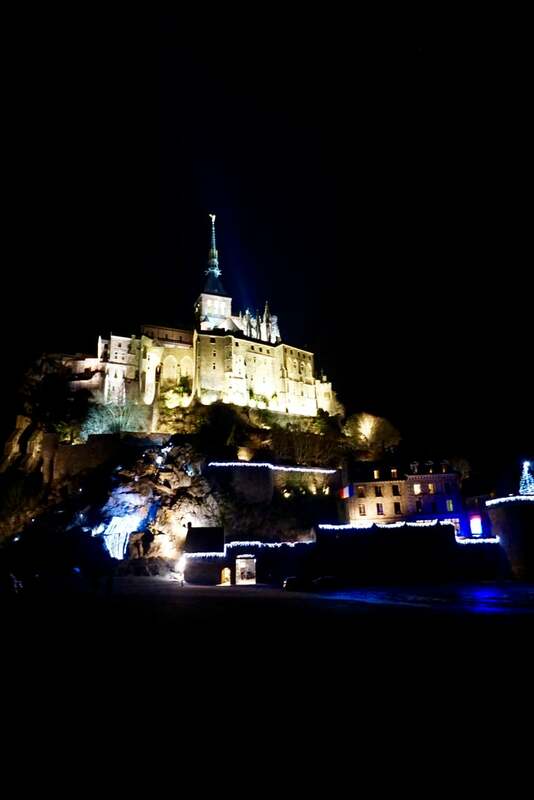 We were just a 5 minute shuttle ride or 25 minute walk from Mont Saint Michel. Alternatively, there are quite a few independent hotels located on the Mont and it is said to be a wonderful experience. However, be prepared. If you are backpacking or have a light suitcase you will be fine, but otherwise you will need plenty of energy. After parking your car, you will take a shuttle to Le Mont. From there, it is about 100 yards from the shuttle drop off into the town where you will begin to climb a labyrinth of narrow streets and stairways to get to your accommodations. No cars are allowed on the Mont. The Views: If you can, walk along the causeway and drive along some of the coastal roads to take in some of the best views of Le Mont. Abbaye du Mont Saint Michel: The current structure was completed in 1523, but origins of the Abbey date back to 708 A.D. with these remains being found in the chapel located under the nave of the abbey-church. The abbey closes to visitors at 5 p.m., but try to arrive as early as possible. We arrived just after 4 and were unable to go inside because of a strike. Eglise Paroissiale Saint-Pierre: A small chapel open to the public. Very charming. La Grande Rue: This is the main street where all the restaurants, pubs and tourist shops are located. Wander through and grab a drink and a meal. Mont Saint Michel Bay: I can't recommend it because I didn't have time to actually do it, but if you're up for it, this walking tour of the bay and the quicksands looks like fun!